On college campuses, fall is a busy time of student activity, Saturday football games and outdoor recreation. 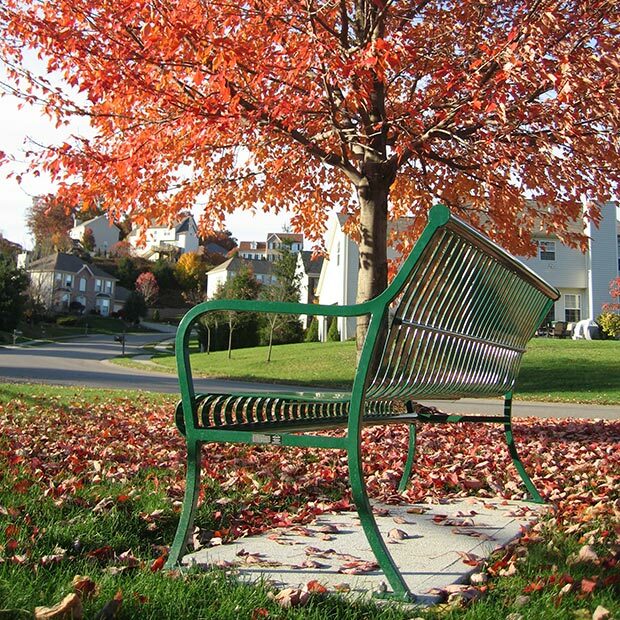 The trail above at Grove City College not only offers a quiet walking path into town but also dedication benches along the way for peaceful respite. 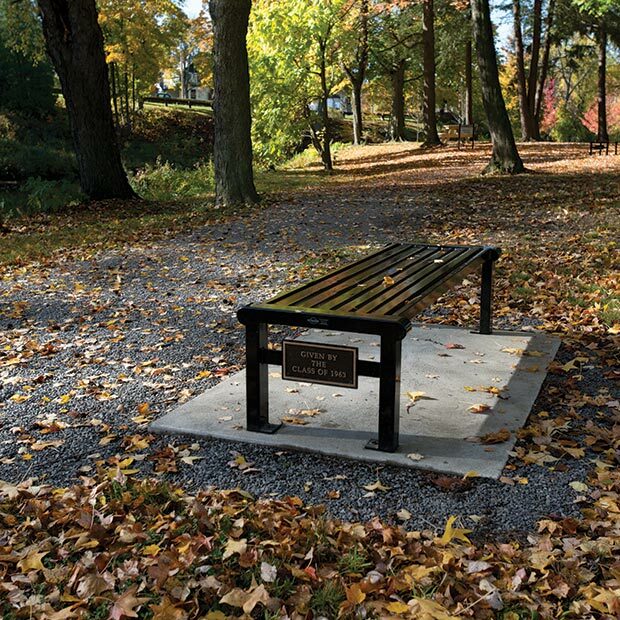 The Reading flat bench was customized with cast bronze plaques for student and alumni recognition. Here is a throwback photo from 2005 when the popularity of our Thendara bench led to a fall photo shoot for the cover of our catalog. 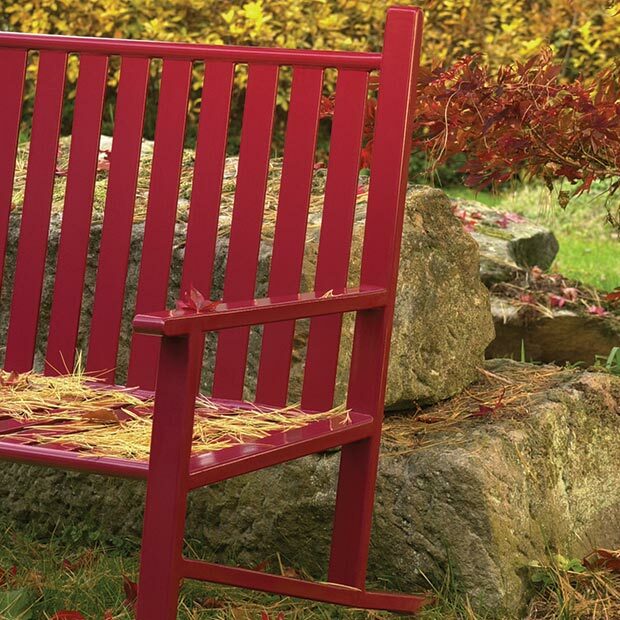 Powder coated in a bright red color and accessorized with fall scenery, this photo resonates the warm, inviting appeal of this Adirondack-inspired bench. When we introduced the Sienna bench, a local community college offered the perfect fall scene to showcase the bench in a natural environment. 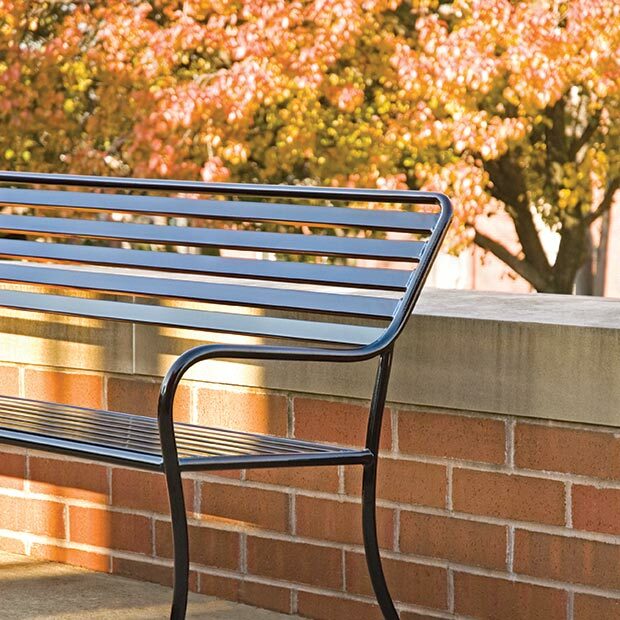 The bricks and fall leaves create a contrasting backdrop for the sleek lines of this bench design. 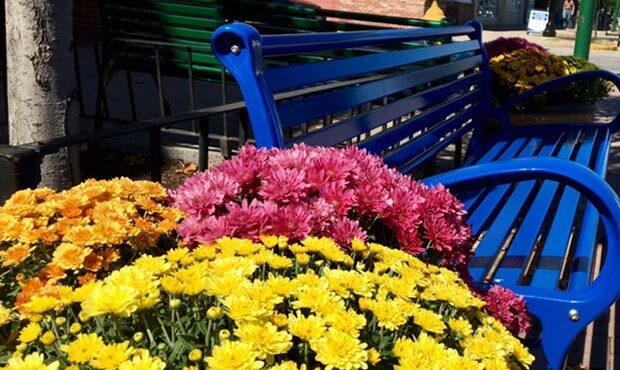 In Brunswick, ME, nothing says fall more than a planter full of gorgeous mums. Paired with our Schenley benches in Nantucket Blue and Evergreen, this photo is a colorful example of streetscape furnishings at work. Sometimes inspiration can be found right in your backyard. This installation of our Pullman bench is in a neighborhood of one of our employees. As the tree grows and changes throughout the seasons, it’s great to see how the bench maintains its original quality and luster. It is a great example of how HOAs can use site furnishings throughout common areas and amenity centers. A library courtyard inspired us to set up a shoot and bring our own fall props. 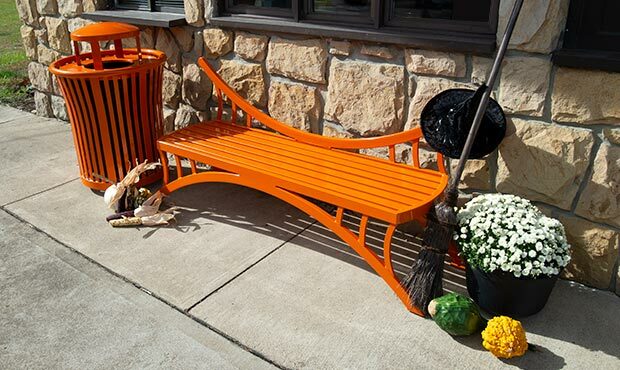 The Dragonfly bench is unique in its own right so why not accessorize it with a witch's hat and broom? The Harmony litter receptacle rounds out the setting to provide an aesthetic waste disposal solution. This final shot offers an interesting depth and a window into the emerging fall scene behind. 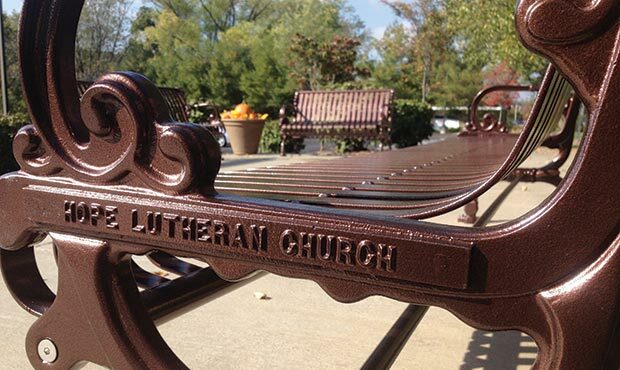 All at once it showcases the Lamplighter bench in a church environment, a custom nameplate, and our Copper Vein powder coat that coordinates well with the warm hues of fall. Whether you are at a college campus, walking down main street, or simply in your own backyard, take a moment to look around and enjoy what nature has to offer this fall. And if Keystone Ridge Designs products happen to be involved, send us your pictures or tag us on Facebook, Twitter, or Instagram. We’d love to see more photos of fall furnishings across the country!